What Is A Puppetry Lab? Puppetry. The art of manipulating an inanimate object to create the illusion of life. Lab. Not the dog breed nor the region on the easternmost coast of Canada. Nor is it the river in Serbia nor the people group in southern Albania. Lab. Not to be confused with the acronyms for such things as lactic acid bacteria nor the League of American Bicyclists. Rather, Lab in this context is short for laboratory. A place to study, learn new techniques, and experiment with new ideas. PuppetryLab.com is here to provide beyond-the-basics training and practical helps for puppeteers, puppet teams, and team directors. 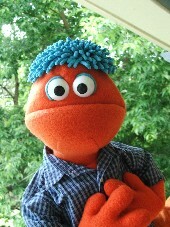 Back in June I posted a few pix of puppets I had been working on for I-Fest. Well, here we are eight months later and I finally got the caricature puppet in the same room with his inspiration. Whaddaya think? 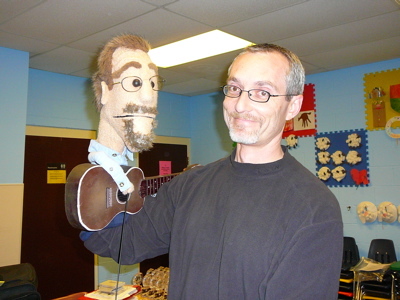 The man is Phil Vischer. He’s the puppeteer (and brains) behind the silliness on the wildly popular web series, The Jelly News; he wrote the book that I puppet-ized last summer–for which I made this particular puppet; oh yeah, and Phil created a little thing called VeggieTales. Phil was kind enough to drop by the Chicago Puppet Festival last weekend where I was able to introduce the two Phils and snap this picture. For the benefit of the uninformed, They Might Be Giants (TMBG) is an American alternative rock band known for odd songs and a unique sound. Their fans span the globe and have been labelled “cult-like”. Their album Flood debuted when I was in high school. I’ve been a fan ever since. 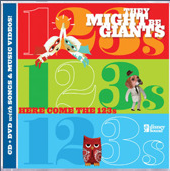 So you can guess that I was thrilled to find a recently launched TMBG video podcast for kids. 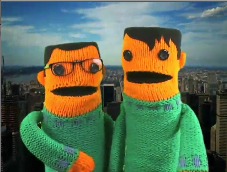 But I wasn’t prepared for the cutesy, crocheted faces (strange yarn-and-felt representations of band founders John Flansburgh and John Linnell) that popped into my screen to introduce the animated segment of the podcast. The puppetry isn’t stellar, but it sure is gosh-darn funny to have John and John puppets intro their new songs for kids. Check out podcast info on their downloads site, or just go right to the details on iTunes. 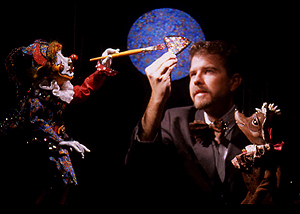 So, enjoy some puppety goodness while I get back in the groove of posting puppety inspiration. Will be back soon. Really. Last week I took my kids to see The Greatest Show on Earth. Besides being overwhelmed with the sights and sounds, the talent and technology, the fun and fears… I found myself wishing that I could pack it all up, replay and freeze-frame certain elements to puppet team directors and performance planners. 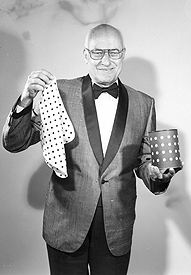 Magicians practice hour upon hour to learn how to misdirect your attention so that you don’t see what they’re really doing. Similarly, this three-ring circus did some serious planning to bring the audience focus away from the darkened areas where they were setting up for the next big act. It was spectacular and masterfully done. "Do Muppet dogs need puppy shots? Do Muppet dogs need walks? Do Muppet dogs need paper training? Certainly not! We just need occasional dry cleaning."